The tuition for students in graduate and professional programs is what really compounds the student loan debt on young persons. The U of M as a land grant institution has a responsibility to provide an accessible and affordable education for our children (including graduate and professional programs that will provide the highly skilled persons we need to provide services to the citizens of Minnesota). The upward spiral in graduate tuition continues in the U of M budget for fiscal year 2014 with increases ranging from 3% to 9%. For example, the tuition for a freshman law student will now exceed $38,000. President Kaler explains that "frankly, there is less political enthusiasm around the cost of graduate education." See the June 6, 2013 Star Tribune report. So it appears that the senior administrators and Regents will be willing to relent only when they are forced to do so by the state legislature. Our twin daughters, Katie & Kelly, received their undergraduate degrees from the U of M in 2008. Katie continued working at the U of M Hospital and was promoted to be a supervisor. In the summer of 2011 she talked to the director of admissions at the U of M for the Master's program in health care administration. She was interested in particular in the part-time program so that she could continue to work full-time at the hospital. The director informed her that the part-time program is completely online and that the cost is $52,000. Then Katie talked to the people at Augsburg College about its part-time M.B.A. program with a concentration in health care administration. (She attended an open house at Augsburg where they served a dinner for all the prospective graduate students!) 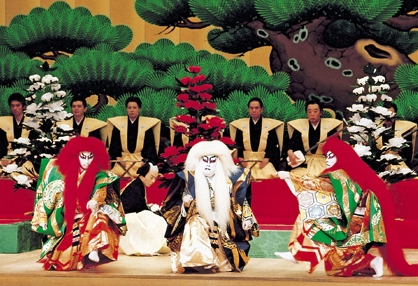 The courses are regular courses with professors and fellow classmates. And the cost is approximately one-half of the cost of the U of M program. A few days after the open house Katie was telling a friend about the Augsburg program as they were eating at an outdoor restaurant. An older couple at the next table got up to leave, and the gentleman told Katie that he overheard her conversation and he was so pleased to hear all her favorable comments about Augsburg. He gave her his card and told her to call him if he could be of any help. It turns out that he is a Regent at Augsburg. 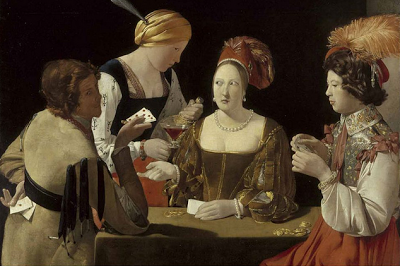 The next day Katie was going to send him an email when she had a break at the hospital to thank him for his offer. Before she could do so the Regent called her on a conference call with the director of admissions of Augsburg College. 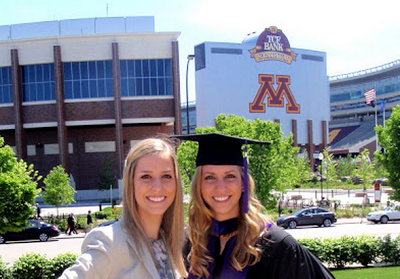 They encouraged her to apply for the part-time Master's program at Augsburg. So she did. Now she is studying at Augsburg--with real professors--and will graduate this year. When informed of Katie's story a senior U of M administrator responded the that the U of M is a research university. But that does not justify the yawning gap in tuition. (In his final appearance before the state legislature President Bruininks testified that tuition is not used to pay for research.) There is also the countervailing factor that as a private college Augsburg does not receive state appropriations. There is a better (and less expensive) way to educate our children, and we need to use those methods at the U of M.
The title of this essay immediately brought to mind the ancient god Moloch, most infamous for child sacrifice. 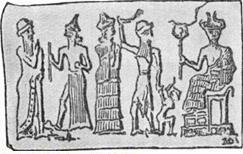 Moloch has been used in English literature from John Milton's Paradise Lost (1667) to Allen Ginsberg's "Howl" (1955), to refer to a person or thing demanding or requiring a very costly sacrifice. Thank you for your letter of May 29, 2013. While I appreciate receiving your response to my letter, the substance of your message is inaccurate and unconvincing. When asked to initiate an investigation into the death of Dan Markingson and the clinical study in which he was enrolled, the standard response from senior officials at the University of Minnesota is to claim that no additional review is required because Markingson’s death has already been thoroughly investigated by the Office of General Counsel, University of Minnesota IRB, FDA, Hennepin County District Court, Minnesota Board of Medical Practice, and the Office of the Minnesota Attorney General. Your response echoes several of these familiar talking points even though they have all been discredited. My previous letter to you provides a brief summary of why there needs to be an independent, impartial investigation of Dan Markingson’s death, the CAFÉ study, and possible psychiatric research misconduct at the University of Minnesota. Here, I limit myself to rebutting the claims you make in your letter. You mention that the death of Dan Markingson has “been the subject of proceedings” before the University of Minnesota’s Office of General Counsel. The Office of General Counsel is not an impartial investigative body. To the contrary, the mandate of the Office of General Counsel is to “zealously represent” the University of Minnesota. In the lawsuit brought against the university by Dan Markingson’s mother, Mary Weiss, the Office of the General Counsel defended the University of Minnesota. The University of Minnesota’s Office of General Counsel advocates for, defends, and advances the interests of the University of Minnesota. It is not a suitable internal body for impartially investigating complaints that faculty members have engaged in research misconduct. Mark Rotenberg, the university’s former General Counsel, should never have been allowed to serve as the University’s legal counsel, in-house “investigator”, and de facto public spokesperson deployed to rebuff calls for an independent inquiry into Dan Markingson’s death. The University of Minnesota must stop misusing the Office of General Counsel in this manner. It is true that Dan Markingson’s case was the subject of legal proceedings before the Hennepin Country District Court. What your letter fails to acknowledge is that in this wrongful death lawsuit the University of Minnesota won summary judgment on the basis that it is statutorily immune from liability. As you must know, to be deemed statutorily immune from liability is not a vindication of conduct. On the contrary, it simply means that the University of Minnesota did not have to defend itself against the lawsuit brought by Ms. Weiss. Such an outcome should never be portrayed as an exoneration of the University of Minnesota. The Minnesota Board of Medical Practice responded to complaints about Dr. Stephen Olson and Dr. Charles Schulz. Unfortunately, your letter omits several key points. The medical licensing board does not investigate universities and institutional review boards. There is therefore no meaningful basis for suggesting that the Minnesota Board of Medical Practice investigated the University of Minnesota. The Minnesota Board of Medical Practice issued form letters stating that “the facts of the case did not provide a sufficient basis for the Board to take disciplinary or corrective action” in response to the filed complaints. However, there is no public record of the Board’s deliberations, the scope of its investigation and the issues it addressed, the evidence it gathered, and the reasoning that informed its conclusions. What is a matter of public record is that the Minnesota Board of Medical Practice does not investigate universities, institutional review boards, and institutional research governance structures. With regard to the FDA, the Establishment Inspection Report issued by the FDA failed to acknowledge the numerous reports documenting that Dan Markingson was psychotic and lacked the capacity to make his own medical decisions. As my May 13 letter to you notes, on at least three occasions shortly before Markingson was enrolled in the CAFÉ study he was judged to lack decision-making capacity. In addition, the person who enrolled him in the study was unqualified to assess decision-making capacity of prospective research participants, under considerable pressure to recruit study participants, and, as the clinical trial coordinator for the trial, had a serious conflict-of-interest. An independent investigation of Dan Markingson’s death and the study in which he was enrolled must examine how and why Markingson was “consented” into a clinical study when he was diagnosed as psychotic, lacked insight into his disease and mental state, and was deemed unable to make informed decisions about administration of antipsychotic drugs. The FDA Inspection Report fails to address the paper trail documenting the various occasions Markingson was deemed mentally incompetent to make his own medical decisions. The FDA Inspection Report also fails to note that Markingson was enrolled in the CAFÉ study despite his mother’s repeated objections. It is possible that this significant flaw in the FDA’s inspection report is connected to the FDA investigator’s failure to interview Dan Markingson’s mother, Mary Weiss, and ensure that her voice was taken into consideration. I must draw to your attention two important omissions in your letter. First, in 2009, the Minnesota State Legislature passed a law that restricts individuals under civil commitment orders from being enrolled in psychiatric drug studies. This statute, as I’m sure you know, is commonly referred to as “Dan’s Law.” I encourage you to reflect upon why it was necessary for the Minnesota State Legislature to pass this law. Second, your letter fails to mention the Corrective Action that the Minnesota Board of Social Work issued to the study coordinator for the CAFÉ trial. According to this document, Jeanne Kenney, the trial coordinator, “regularly completed forms, gathered information, and performed tasks that were beyond Licensee’s competence and scope of practice as a clinical social worker.” Kenney also made numerous documentation errors, dispensed prescription drugs without authorization and in violation of University of Minnesota policy, initialed documents with a doctor’s initials, failed to respond to family concerns in a timely and effective manner, failed to document key information related to medical interventions and treatment plans, prepared documentation that “consistently fell below the minimum standards of practice for a clinical social worker,” failed to develop a “clearly articulated, consistent set of treatment goals,” failed to document in a timely manner “alarming voicemail messages from family members,” and “effectively invalidated” Dan Markingson’s original informed consent by failing to disclose to him new information concerning risk of hyperglycemia and diabetes. Of particular significance, the Board of Social Work found that “there were critical omissions in Licensee’s documentation that were relevant to suicide prevention and chemical dependency treatment.” Given the findings of the Minnesota Board of Social Work, it is noteworthy that you and other senior administrators at the University of Minnesota fail to mention this document when you list prior investigations of Dan Markingson’s death. The Corrective Action issued to Jeanne Kenney reveals the need for an investigation that examines all layers of oversight and includes analysis of the faculty members responsible for supervising the clinical trial coordinator and conducting the study. There is an urgent need for an independent and impartial investigation of Dan Markingson’s death, the study in which he was enrolled, and possible psychiatric research misconduct at the University of Minnesota. Carl Elliott, my colleague here at the Center for Bioethics, makes an exhaustive case for such an investigation. Senior officials at the University of Minnesota claim that Markingson’s death was fully reviewed. However, an independent, thorough investigation has not occurred. I therefore ask you to reconsider your decision, sign the petition initiated by Mary Weiss and Mike Howard, and write to Governor Dayton and request an independent investigation of possible psychiatric research misconduct at the University of Minnesota. Whatever you decide, I want my correspondence with you to document that in the strongest possible terms I urged you to support such an investigation. Elliot told me in an interview last week. "There were so many things that went wrong -- the consent process, the commitment order under which [Markingson] was recruited into the trial, the financial incentives of the university, the financial incentives of the investigators, the sheer worthlessness of the trial. Anyone who looked into this and knew anything about clinical research would say this is terrible." "A schizophrenic, Markingson killed himself in 2004, while enrolled in a study at the U comparing anti-psychotic drugs. Documents surfacing the past year in a lawsuit over his death have raised questions about whether the U psychiatrist running the study followed university ethical guidelines. They also raise questions about why the Institutional Review Board, the internal group charged with protecting people in university studies didn't intervene." It should be noted that the work of Olson and Tosto was awarded the Premack Prize for invesigative journalism by the University of Minnesota School of Journalism. Judges said of their work: "Through the eyes of one patient, this story shed considerable light on the complicated and competing interests between the development and path to market of new drugs, funding needs of the University and the integrity of medical research." 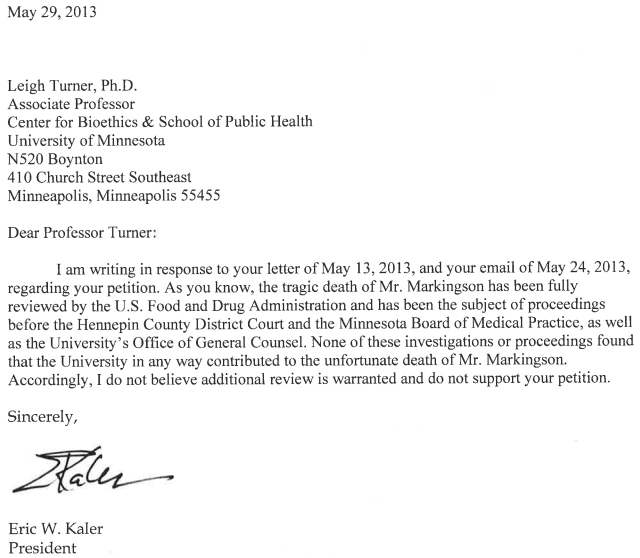 My colleague Professor Leigh Turner of the University of Minnesota Center for Bioethics has sent two communications to President Kaler asking him to sign a petition - currently at 2700 signatures - for an independent review of the death of Dan Markingson, a participant in a clinical trial at the University of Minnesota that ended for him in suicide. I am perplexed as to how the president could make the claim that the actions of the University did not "in any way" contribute to the death of Mr. Markingson. Even a small sampling of the events that occured makes this claim very difficult to back up. The fact that the General Counsel at the University of Minnesota did an investigation means exactly nothing. He is the University's mouthpiece and the results of his supposed investigation were never made public. The Hennepin County District Court only concluded that the University was immune from prosecution, not that the University did not do anything wrong in the matter. The claim that the Minnesota Board of Medical Practice investigated the matter is simply meaningless since the records of the Board are closed. So to claim that the U has somehow been exonerated by the Board is unprovable. The FDA investigation has also been debunked. See: "How the FDA got the Markingson case wrong." So why is the University of Minnesota so afraid of an unbiased, outside, investigation? If it is true that the U has done nothing wrong, why not do it? The fact that a large number of people both inside and outside the University have asked that this be done is of no consequence? Many of these people are alums, faculty, and citizens of the state of Minnesota. And these people - like me - will remember, when the subject of the University of Minnesota comes up, the less than honorable way in which the U has behaved in this matter. People thinking about enrolling in clinical trials should be aware of what happened at Minnesota to Dan Markingson, and that the University apparently thinks the way he was treated is perfectly OK. They should also be aware that if any negligence should occur, the U is immune from a lawsuit. I hope that this information is given to prospective enrollees as part of the informed consent process. The University of Minnesota needs to fix its demagnetized moral compass. Just because something is not illegal does not mean that it is ethical. Hoping to be a proud Gopher again, when this situation is finally addressed by the University of Minnesota. What amazes me most about this situation is the absolute blinders the administration wears. The history of the U of M over the past 2 1/2 decades is so filled with high-level unethical behavior it's amazing. If Dr. Kaler wants to move forward the only way to do so is to put this behind us. He should consider appointing an independent panel of bioethicists and clinicians to investigate this claim free from the contamination of the U of M on both sides--on the "yes you did" and the "no we didn't" sides. Accept the outcome, apologize and pay up if necessary. Then, clean up the house at the U of M. Throw out that weak conflict of interest piece that was instituted and adopt the one that was conveniently ignored. Last, no more BS like the Polly incident, the Najarian incident, the Schulz-Seroquel marriage, the Polla scandal, the Sainfort-Jacko scandal, the Furcht scandal, and so on. U of M psychiatrist S. Charles Schulz: misleading claims about Seroquel? Professor Gleason, I could not agree more with your assessment of the response letter from Dr. Kaler. Having followed this episode in the media and internet and realizing that what happened to this young man could happen to anyone, and this is the response from the president of the University? 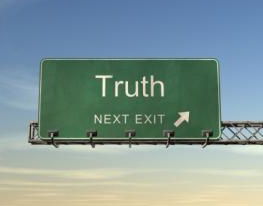 There is not even a hint that Dr. Kaler is interested in the unbiased truth once and for all, just the regurgitation of the same denials that have never once been proven. I just recently read where the University sent lobbyist over to the capitol back a few years ago to try and persuade legislators to not vote for Dan's Law. The strategy backfired and the law was passed unanimously. Where is the mention of the fact that a law was passed in this state because of the unethical and coercive behavior of university research psychiatrist? Dr. Kaler doesn't mention it, he simply spews the same rhetoric the University has done for years to bolster their denials and lies. I'm ashamed of the behavior of Dr. Kaler in his response, he's suppose to be a leader, not a follower. Good question. If Dan's Law was necessary, how can the U administration claim that nothing wrong was done in this matter? And why did they lobby against Dan's Law? If this had been the case, “Dan’s Law” — which was passed unanimously in both the Minnesota House and Senate in 2009 — would have been entirely unnecessary. This law now prevents anyone on a stay of civil commitment from entering a psychiatric clinical drug study and also prohibits any doctor from putting his or her own patients into his or her own clinical drug study. I find this response from the President of the University of Minnesota absolutely disgusting. He's responding to a professor at his own university who seems to be genuinely concerned about whether in fact the university did or has done everything possible to give closure to this mans family, and the best he can offer is we've been exonerated by ourselves, but don't ask me for any proof. He would have been better off not saying anything and continued the university's pattern of stonewalling the truth. Mr. Kaler, you have certainly not distinguished yourself in any manner, and I hope residents of our state remember this every-time you show up at the capitol with your hands out and trying to defend the top-heavy administration that you created and condone. There are 2700 signatures for the petition when the U has a student population of over 51,000 and faculty and staff population of over 3,000? That's not too terribly impressive. "The FDA investigation has also been debunked." The author of the article "debunking" the FDA investigation is none other than Carl Elliott. That's hardly an unbiased source. Did you read Professor Elliot's article debunking the FDA report? I use the word "debunking" as my professional opinion. Here is a link to the article. If you disagree with Dr. Elliot's analysis, please explain why. Whether 2700 signatures on a petition is worth blowing off is a matter of debate. Given the credentials of those signing and the fact that many are alums, faculty, students and citizens, I wouldn't attempt to minimize these efforts. One powerful example is: "Attended U of MN Medical School. then U of MN Psychiatry Residency - ashamed of the Psychiatry Department - have been in private practice since 1977 - Have seen first hand the hijacking of Psychiatry by BigPharma." Plenty more where that came from. The one glaring question that the University and now Dr. Kaler has forever avoided or refused to acknowledge is...if there was no wrongdoing of any kind...why did the University seek immunity under state law from being sued? Why not have just welcomed the suit and let the facts speak for themselves? It's now very apparent from Mr. Kaler's response that the University has no desire for the truth, and in fact is afraid of it. The U of M administration uses the FDA investigation in 2005 as a primary reason to reject another investigation. But in 2012 the Minnesota Board of Social Work took corrective action against the social worker who was the study coordinator. Perhaps the most damning finding was that "there were critical omissions in [the social worker's] documentation that were relevant to suicide prevention." The response from the U of M general counsel was that the social worker is no longer an employee of the University. This is the response of an institution that places a higher priority on the protection of its reputation than on the protection of its patients. Would you be interested in having your son participate in a clinical trial run by these folks? This research would never be approved by an Institutional Review Board today. Indeed, an independent review of the case would go a long way to address any institutional irregularities and provide guidance to future remedies. It is a terrible miscalculation by Dr. Kaler. Who is getting more of a financial aid boost out of next year’s University of Minnesota budget? The last post looked at some tuition-and-fee highlights of the upcoming FY2014 budget. But what about financial aid? The document shows an interesting split: merit-based aid gets a $2.9 million boost, while the Promise Scholarship, the U’s institutional need-based aid program, gets nothing. More specifically, the merit aid boost includes $2 million for merit-based recruitment aid, $857,000 for the 21st Century Scholarship program and the Presidential Scholarship Match program, and $55,000 for an expanded national recruitment program. At the moment, the budget document states, the $30 million Promise Scholarship program could serve more than 13,000 low- and middle-income families. Award levels will stay the same because of the tuition freeze, and current funding for the program should be enough to support it. The report also referred to the state’s 15 percent increase to the Minnesota State Grant Program, the state’s main source of financial aid. It estimated that the average increase for grant holders would be $718 per year, or about 6 percent of the tuition rate for resident undergrads at the Twin Cities campus. I have a feeling the U might take a little heat about this at the public hearing. Meanwhile, I’ll try to get a little more info behind the reasoning. Yes we have a tuition freeze! I’ll have more details soon, but U officials are clearly proud of their two-year tuition freeze, funding for which President Eric Kaler had made a main part of his plea to the legislature. Resident graduate and professional students aren’t so lucky. They’d see see a tuition increase of 3 percent. Fees are a mixed bag, depending on the campus. But the U froze the collegiate fee — apparently a first for that one. The largest percentage increase in fees was the student-services fee on the Twin Cities campus, which would rise 12.6 percent. Spokesman Chuck Tombarge said students approved it to pay for rec center improvements and expanded mental-health serves. Update: In percentage terms, overall tuition and fee increases per campus look like this: Crookston (-0.1 percent); Duluth (0.2 percent); Morris (0.3 percent); Twin Cities (0.7 percent). Overall: Increases in the total price tag for tuition, fees, room and board would rise from 0.8 percent in Crookston to 1.9 percent at the Twin Cities campus. Some lawmakers and the public have complained in the past that nonresident tuition at the U is too low, and the U has responded with what appears to be the first of several increases over the coming years. Nonresident undergrads would pay $1,000 more on the Twin Cities and Duluth campuses. (I believe most or all of the others will continue to charge the same rate for all undergrads.) Foreign students will also pay an extra $250 a year for improved academic services. The proposed budget for fiscal year 2014 shows general state appropriations in the amount of $515,211,000. See p. 84 of the June 5, 2013 report of the Board of Regents. These are unrestricted funds that the senior administrators and Regents may allocate as they wish. The porposed allocation for the law school is $4,515,117--less than 1% of the state appropriations. See p. 86 of the June 5, 2013 report of the B of R. The senior administrators and the Regents are starving the law school of state appropriations and continuing to increase tuition at skyrocketing rates. (It appears from attachment 4 to the June 5, 2013 report that the proposed increase for the 1L class is 9%.) 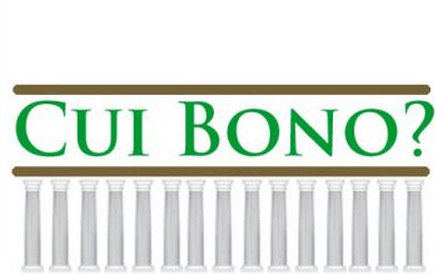 This course of conduct has effectively transformed the law school into a private school as far its finances are concerned.The law school sends out fund raising letters that assert that less than 10% of its budget comes from state funds. The fact is that central administration makes the allocation of state funds to the law school and not the state legislature. The administrators and the Regents are also continuing to hammer the students in other graduate and professional programs. The people making these decisions did not have to start their careers with crushing student loan debt. See my March 16, 2013 email to Rep. Gene Pelowski (below). See also Skewed U. At the hearing on March 13 President Kaler hinted that the U of M administration may be willing to freeze tuition (and fees?) on the condition that the legislature increases state appropriations by at least $42 million. It is likely that he is referring to undergraduate tuition only (and for Minnesota residents only). See: An Institution Adrift (fifth paragraph). The tuition for students (both resident and non-resident) in graduate and professional programs is what really compounds the crushing student debt on young persons. The U of M as a land grant institution has a responsibility to provide an accessible and affordable education for our children (including graduate and professional programs that will provide the highly skilled persons we need to provide services to the citizens of Minnesota). 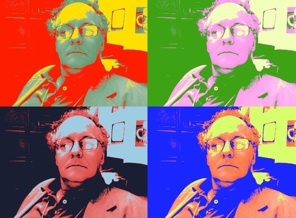 My friend and colleague, Dr. Carl Elliot has posted on this matter on his blog, Fear and Loathing in Bioethics. I re-post it here, for the record, with his permission. Over the past year, as the controversy over psychiatric research at the University of Minnesota has steadily grown more heated, President Eric Kaler has remained silent. Most of the public statements about the case of Dan Markingson have come from Mark Rotenberg, the former General Counsel, or more recently, Aaron Friedman, the VP for Health Sciences. But yesterday Kaler made his position clear. Apparently he believes that no one at the university is blameworthy, and that no further investigation is warranted. 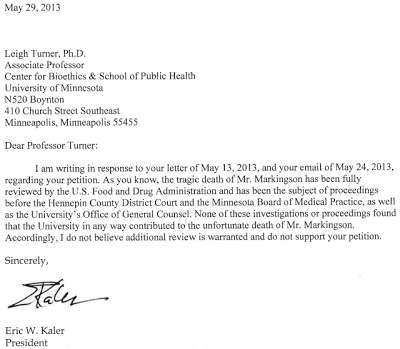 Two weeks ago my colleague in the Center for Bioethics, Leigh Turner, sent Kaler a detailed letter about the suicide of Dan Markingson, asking him to support an external investigation. Kaler’s reply is revealing, but not for anything specific that he writes. His letter simply repeats the discredited claims of exoneration that we have heard for the past four years. What is revealing is the fact that he has taken such a clear stand on the issue. Kaler was not even at the University of Minnesota when Dan Markingson killed himself, and he was not responsible for appointing anyone directly involved in the research, or in the legal defense, or in the subsequent stonewalling. He could have chosen the side of justice -- or more plausibly, he could have chosen to remain neutral. Yet he didn’t. Such a letter could have been only written by a president who is either 1) very confident that no wrongdoing has occurred, or 2) that there will be no external investigation and no sanctions for anyone involved. And since anyone who has bothered to become familiar with the Markingson case knows that there was very serious wrongdoing, I can only conclude that Kaler believes that the university and its researchers are safe from investigation and sanction. I hope that we can prove him wrong. My friend and fellow alum, Michael McNabb, has already posted on the upcoming Kabuki theater performance that is the Board of Regents meeting where pro forma comments by the public have been invited on a budget that was not available until after the deadline for people to request to speak to it. I am sympathetic to members of the Board because their job expectations seem to be rapidly changing, if the words and actions of the state legislature are to be taken at face value, e.g. We are entering a time in higher education where change will be rapid and business as usual will not suffice. Decisions about things like MOOCs will have to be made. These involve resource allocation as well as the inevitability of accepting MOOC courses for credit. A particularly egregious example of foot-dragging and refusal to face facts occurred right before Mr. McNabb's post. 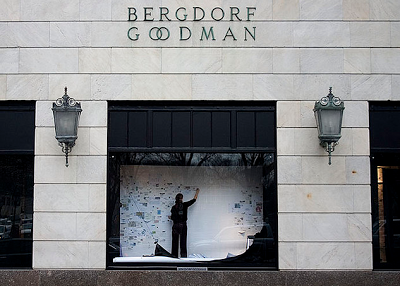 It made me think of how much of University of Minnesota administration really is devoted to window dressing. Or bottom covering in the Markingson case. I am pleased to provide you with an update on the University's search for a new dean of the Medical School and vice president for health sciences. Based on the input we received through these listening sessions and the external review, I have decided to change the position title to Dean of the Medical School and Vice President for Health Sciences. The new title of dean and vice president is to clarify that the primary responsibility of this position is leadership of the Medical School. As I have said since my inauguration, I know of no great university without a great medical school. We have many strengths and much to be proud of in the Medical School. What I have heard from faculty, staff, and students is that what is necessary to take us to the next level is vision, a strong voice, and a dedicated leader. The role of vice president is also critical to the University and to Minnesota. Interprofessional education has never been more important to students and the health care community. Interdisciplinary research is critical to funding and to finding the next cures and treatments. The vice president will continue to lead these efforts, convene our health science colleges and schools, oversee our clinical activities, develop strong relationships with the health care community, and coordinate our health care strategy. This is an important and complex job. In addition to leadership of the Medical School and coordination of the health sciences, this dean and vice president will also be a senior leader of the University, a community leader, a spokesperson for the health sciences, and the primary leader of our relationship with Fairview, including chairing the board of the new integrated structure. In order to attract top talent to this position, it needs to be a combined position. But he is also an idiot. So much for top talent. "Someone was saying to me, 'Well, you know, Bret Bielema leaving ... that was a blessing for Wisconsin and they knew it,' " Gee said, according to the full tape published by SI.com. " 'Because he was under tremendous pressure. They didn't like him. (Wisconsin AD) Barry Alvarez thought he was a thug. And he left just ahead of the sheriff.' "
Gee said, "You tell the SEC when they can learn to read and write, then they can figure out what we're doing. I've been down there. I was the chairman of the Southeastern Conference for two years. I'll tell you something. It's shameful. It really is." So much for top talent.